Bosleys are pleased to announce that the medal section of the 5th July auction will be complemented by a number of Naval General Service Medals, among which is a three clasp example which includes the action of the Glorious 1st June 1794, when 1st Earl Howe Commander of the Channel Fleet engaged his 25 ships, against 26 ships of the French Fleet, this was to be the first major action of the French wars. The recipient serving as an Able Seaman onboard HMS Brunswick a 74 Gun ship of the line, during the battle she was in the the thick of the fighting and received the highest "Butchers Bill" of any Royal Navy ship present in the battle, with 45 killed and 114 wounded, including Captain Harvey who died of the wounds he received while sinking the French ship Vengeur du Peuple. A single clasp example represents one of Lord Nelsons greatest Victories over the French the Battle of the Nile and was awarded to Ship’s Standing Officer Carpenter Thomas Jarrett of HMS Leander a 50 gun fourth rate. 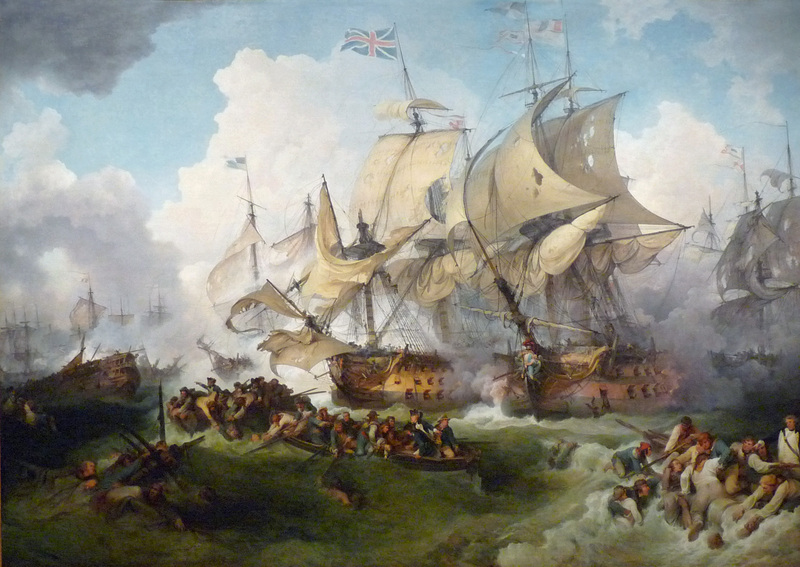 At the Nile Leander under Captain Thomas Thompson was able to exploit a gap in the French line and anchor between Peuple Souverain and Franklin, from which position she raked both enemy ships while protected from their broadsides. In the battle she suffered only 14 men wounded. She was then ordered to carry Nelson’s despatches but on route was engaged by the 74-gun French third rate Généreux off Crete. After a fierce battle she was taken by the French, her crew were subjected to great hardship under the French, the British Officers were later exchanged, but Carpenter Thomas Jarrett is mentioned as receiving harsh treatment and was refused an exchange as he had refused to reveal to them the dimensions of Leander's masts and spars. 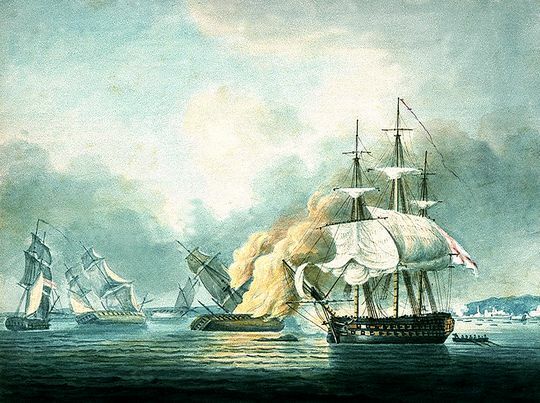 An Officer’s Naval General Service awarded to Midshipman Phillip Lardner represents the action of the 22nd May 1812 when HMS Northumberland a 74 Gun Third Rate ship of the Line, engaged two French Frigates Ariane and Andromaque. The action resulted in the loss of both French ships. A number of medals will bear the clasps of daring boat actions, all representing the "Nelson” spirt of the Royal Navy at this time.